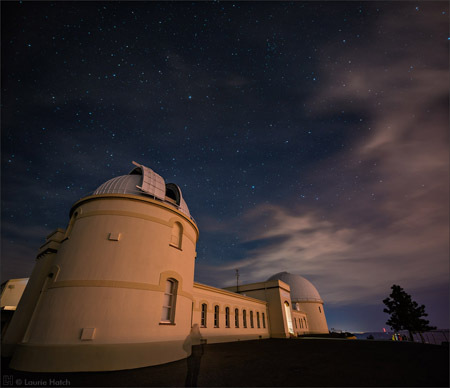 A new type of gamma-ray telescope will be unveiled January 17 in an inauguration event at the Fred Lawrence Whipple Observatory in Amado, Arizona. Expected to see first light in early 2019, the telescope is a prototype Schwarzschild-Couder Telescope (pSCT) designed for the Cherenkov Telescope Array (CTA), the next generation ground-based observatory for gamma-ray astronomy at very high energies. David Williams, adjunct professor of physics at UC Santa Cruz, chairs the CTA-US Consortium. The CTA Observatory, for which construction will begin in 2019, will be the world’s largest and most sensitive high-energy gamma-ray observatory, with more than 100 telescopes located in the northern and southern hemispheres. The 9.7-meter aperture pSCT is a pathfinder telescope for use in the CTA and exploits a novel optical design. Its complex dual-mirror optical system improves on the single-mirror designs traditionally used in gamma-ray telescopes by dramatically enhancing the optical quality of their focused light over a large region of the sky, and by enabling the use of compact, highly-efficient photo-sensors in the telescope camera. The CTA Observatory (CTAO) will consist of 118 telescopes of three different sizes and is expected to detect sources of gamma rays in the energy range 20 GeV to 300 TeV, with about ten times increased sensitivity compared to any current observatory. Notable for providing improved gamma-ray angular resolution and its very-high-resolution camera (more than 11,000 pixels), the SCT is proposed for the medium-sized CTA telescopes and will primarily contribute to the middle of CTA’s energy range (80 GeV to 50 TeV). “The SCT and other telescopes at CTA will greatly improve upon current gamma-ray research being conducted at HAWC, HESS, MAGIC, and VERITAS, the last of which is located at the Fred Lawrence Whipple Observatory,” said VERITAS Director Wystan Benbow. The Whipple Observatory is operated by the Harvard-Smithsonian Center for Astrophysics. The SCT optical design was first conceptualized by U.S. members of CTA in 2006, and the construction of the pSCT was funded in 2012. Preparation of the pSCT site at the base of Mt. Hopkins in Amado, AZ, began in late 2014, and the steel structure was assembled on site in 2016. The installation of pSCT’s 9.7-meter primary mirror surface, consisting of 48 aspheric mirror panels, occurred in early 2018, and was followed by the camera installation in June 2018 and the 5.4-meter secondary mirror surface installation, consisting of 24 aspheric mirror panels, in August 2018. Leading up to the inauguration and in preparation for first light, scientists opened the telescope’s optical surfaces in January 2019. The SCT is based on a 114-year-old dual-mirror optical system first proposed by Karl Schwarzschild in 1905. It became possible to construct only recently as a result of critical research and development progress made at both the Brera Astronomical Observatory and Media Lario Technologies Incorporated in Italy. The pSCT was made possible by funding through the U.S. National Science Foundation Major Research Instrumentation program and by the contributions of thirty institutions and five critical industrial partners across the United States, Italy, Germany, Japan, and Mexico. More information about the pSCT is available online at http://www.cta-observatory.org/project/technology/sct. Today’s paper is historical in nature rather than a current summary – it describes the 1989 paper that essentially birthed the field of ground-based gamma-ray astrophysics by making the first > 5 sigma detection of a TeV gamma-ray source! Gamma rays lie on the highest-frequency end of the electromagnetic spectrum and have been observed spanning a few orders of magnitude in energy, starting from a few hundred keV, going through the MeV range, the GeV range, and beyond. The most energetic gamma rays observed to date have been in the TeV range, which is roughly the same energy the proton collisions at the Large Hadron Collider take place at. 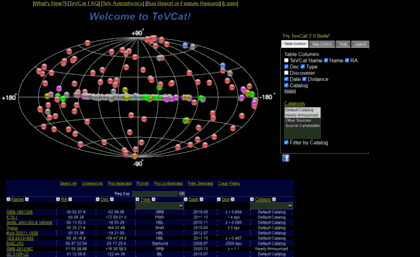 TeVCat currently lists 198 known TeV gamma-ray sources. They are associated with some of the most energetic and violent things in our universe, including supernova explosions and active galactic nuclei. TeV gamma-ray sources are of particular interest because of their ability to probe phenomena associated with some of the big unsolved problems in astroparticle physics – they are associated with the acceleration sites of charged cosmic rays, but are somewhat easier to study since gamma rays are electrically neutral and don’t curve in magnetic fields on their way to us. This means that they point directly back to their sources. The origins and acceleration sites of charged cosmic rays are still open questions – we know a large portion of the galactic cosmic rays originate in supernova explosions, but don’t know a whole lot else. They can also be used for other science; for example, many current gamma-ray observatories are involved in finding electromagnetic counterparts to gravitational waves. When a gamma ray hits the Earth’s atmosphere, it interacts with the air molecules and creates what is known as an extensive air shower. This means that it is not possible to directly observe the gamma ray from the Earth and its indirect products must be studied instead. The extensive air shower consists of many electrons and positrons, some of which are traveling faster than the phase velocity of light in air. This leads to the emission of a type of radiation known as Cherenkov radiation. Detecting this radiation is one of the ways that we can indirectly detect gamma rays on the Earth, and many currently running experiments (such as VERITAS, MAGIC, and HESS) have used this technique to great success. The spectrum of the Crab Nebula. The “W” is the measurement from this paper, the others are results from earlier experiments, which were less significant detections. The lines are the predicted spectrum for two different values of the magnetic field. In 1989, everything changed for the field of ground-based gamma-ray astrophysics. That was the year that scientists published a 9 sigma detection of TeV gamma rays from the Crab Nebula, the first unambiguous detection of gamma rays (from any source) at TeV energies. 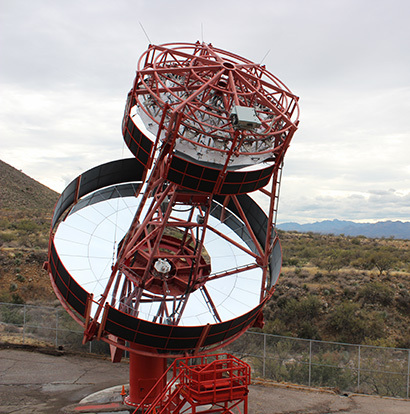 The data was collected at the Whipple Observatory in Arizona, which had a 10 m reflector outfitted with a 37 pixel camera to detect the Cherenkov radiation described in the preceding section. The 37 phototubes were arranged in a hexagonal pattern and were capable of tracking sources across the sky. It was the improved gamma/background discrimination that led to the unambiguous detection. After each observation, the data was calibrated, the observed showers parameterized, and then candidate gamma rays were selected. Monte Carlo simulations were used to predict how the camera would respond to gamma-ray initiated showers and hadron-initiated background showers. 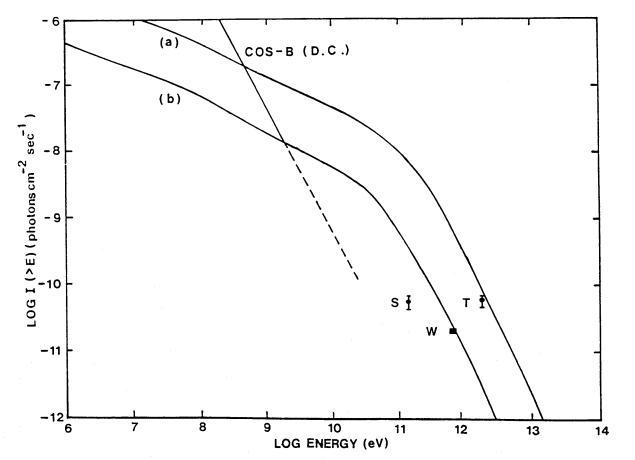 When the analysis was finished, the Crab Nebula was seen with a significance of 9 sigma above an energy threshold of 0.7 TeV. No variability was observed over the months or years the data was taken over, and it was established that the emission was likely coming from the hard Compton synchrotron spectrum in the Nebula. The authors close the paper by noting that observing a steady source such as the Crab Nebula is important for the field of TeV gamma ray astronomy, since such a source can be used as a standard candle in calibrating new detectors. In fact, this is still true today. Nearly every gamma-ray experiment starts off their life by publishing a paper with their observations of the Crab Nebula, as it is still the most significant source in the gamma ray sky!